Salvia leucophylla is a California native plant that grows in the wild from Santa Barbara to Orange County. Point Sal Sage is a collected form of this wild native. There are actually two different Point Sal Sages. One is a prostrate or low growing form and one is a tall stately shrub. Ours is the later. 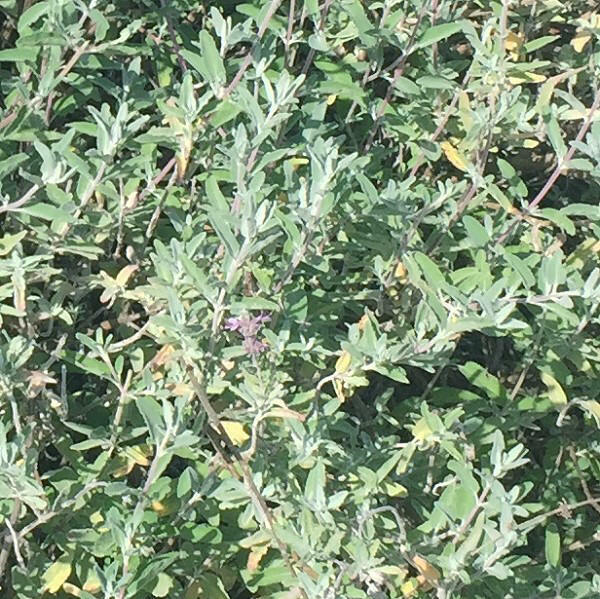 Point Sal Sage is a very drought tolerant summer dormant plant. Summer dormant plants in nature take advantage of winter rains and bloom in early spring. Since water is not usually available in the summer months, they stop growing and hunker down until it rains again. Unfortunately, they may not look great during this period. In the garden, we grow these kinds of plants at the edges of the gardens where water is sparse but adequate to keep them looking good through the hot summer months. Point Sal Sage has striking white leaves and long stems of pink pom-pom flowers. Hummingbirds are frequent visitors which adds to the diversity in the garden. This plant is sometimes available in plug trays. These trays hold 128 of all the same plant. They are a great low cost way to fill a lot of space. Each cell is 3/4 of inch by an inch. Check here to see if Point Sal Sage Plug Trays are available.